MLNP: "Sunday and Monday" are the new "Friday and Saturday"
"Sunday and Monday" are the new "Friday and Saturday"
So Scene Sundays.. would be like friday night, just got paid, come as you are and have at it. 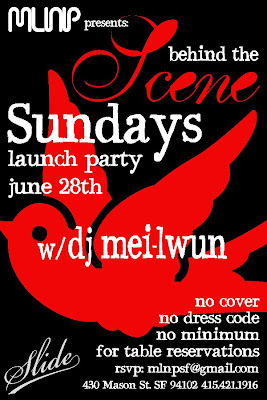 Its our official launch party this Sunday June 28th. 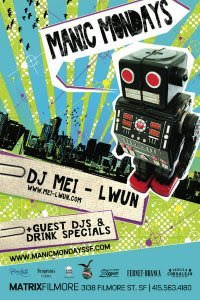 There are a few tables still avail so email your party to mlnpsf@gmail.com and we will reserve you a table at no cost with no minimum. dope huh? Join the MLNP mailing list and get these offers first. The sign up is at the top rhs of this blog. Believe it Ninjas!! Mondays that feel like a Saturday. MANIC has been rolling strong for a year + now if you haven't checked it out you are sleeping on one of most fun events SF has to offer.